Today (22/05/2015) marks the 35th Birthday of one of gaming’s most iconic and recognisable characters; Pac-Man. So I decided to hold a celebration for him in the form of a gaming overview of the original arcade game, a bio of Pac-Man on his 35th Birthday as well as this multi-part retrospective look at every “official” Pac-Man game released in the franchise. This is going to be my biggest retrospective yet. Pac-Man: First released in Japan on May 22, 1980 by Namco. It was licensed for distribution in the United States by Midway and released in October 1980. Pac-Man was created by Tōru Iwatani who based Pac-Man’s look on a pizza with a slice missing as well as the Japanese folklore character Paku who was known for his ferocious appetite. Pac-Man was a simple game involving you controlling Pac-Man around a maze, trying the clear the screen of pellets all while avoiding the enemy ghosts. But eat a power pill and you could turn on your ghost enemies and eat them. While Pac-Man was a very simple formula, it also held a lot of “firsts” in gaming. From Pac-Man becoming gaming’s first iconic mascot with his image put on everything from lunch boxes to duvet covers. 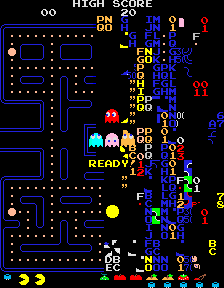 Pac-Man also became known for one of the first games to feature programmed AI as the four enemy ghosts had their own personalities and behavioural patterns. But Pac-Man was also the first to use cutscenes in the game, while these cutscenes didn’t tell a story, they did provide fun entertainment between levels. In September 1983 Walter Day, chief scorekeeper at Twin Galaxies, organised and took the US National Video Game Team to visit video game players who claimed they could get through the Kill Screen of Pac-Man. Yet none of the players could demonstrate or prove their claims. Then in 1999, Billy Mitchell (legendary game player) offered $100,000 reward to anyone who could pass through the Pac-Man Kill Screen before January 1, 2000. The $100,000 reward was never claimed. Pac-Man initially met with mediocre response as other games like; Space Invaders were proving much more popular at the time. But you don’t get a 35 year old legacy from being mediocre. Pac-Man slowly started to gain favour and soon became a favourite with arcade gamers, grossing over $1 billion within a decade by the end of the 1980s. Pac-Man sold more than 350,000 arcade cabinets in 1981 and by 1982, the game had sold 400,000 arcade machines worldwide with an estimated 7 billion coins had been inserted into Pac-Man machines around the world. Pac-Man was ported to pretty much every popular home machine at the time including; Atari 5200, Atari 2600, Atari 800, Atari 8-bit, Commodore VIC-20, Commodore 64, Apple II, Intellivision, NES, MSX and many others and is still being ported to modern consoles today. Pac-Man became hugely popular by 1982 and 1982 is when we would see Pac-Man’s follow up released. Ms. Pac-Man: This title didn’t originally start out as a follow up to Pac-Man. The game started out as an enhancement/conversion kit for Pac-Man called; Crazy Otto. This was created by programmers from the General Computer Corporation (GCC). While Crazy Otto was being developed, GCC had to settle a lawsuit with Atari over their Missile Command conversion kit; Super Missile Attack. Part of the settlement terms barred GCC from selling future conversion kits without consent from the original game manufacturer. Rather than just scrapping Crazy Otto entirely, the programmers at GCC decided to show their project to Midway who were Namco’s American distributor of Pac-Man. Midway had been waiting for Namco to develop its next Pac-Man game to be released in America, and were very happy with what they saw with Crazy Otto. So Midway bought the rights to Crazy Otto, changed the sprites to fit that of Pac-Man universe, renamed the game Ms. Pac-Man, and released it into arcades. Ms. Pac-Man became wildly popular, even more so than Pac-Man before it. Midway and GCC undertook a legal battle concerning royalties. The game was developed without Namco’s consent, causing both companies (Midway and GCC) to eventually turn over all the rights of Ms. Pac-Man to Namco. Ms. Pac-Man was the first in a series of unauthorized sequels that eventually led to the termination of the licensing agreement between Namco and Midway later on. Though GCC co-founder Doug Macrae has disputed stories that the game was manufactured without Namco’s blessing, claiming that Masaya Nakamura, who was Namco president at the time had in fact given his blessing to the game and even provided feedback over character artwork during Ms. Pac-Man’s development. The spaces between the walls of the maze have been filled in making the maze easier to see. The game now has four different mazes that appear in different colour schemes. The cutscenes were changed to follow a developing relationship and story between Pac-Man and Ms. Pac-Man. The orange ghost is renamed Sue, rather than Clyde. The ghosts’ behavioral patterns were programmed differently, and include some semi-random movements which prevents the use of same playing patterns to clear each round. Fruit bonuses bounce randomly around the maze instead of appearing in the centre. As Ms. Pac-Man was just a “re-packaged” Pac-Man, the game sees the return of the infamous Pac-Man Kill Screen which renders the 256th round unplayable. Ms. Pac-Man became the most successful American-produced arcade game, selling 115,000 arcade cabinets worldwide and helped to cement the Pac-Man name and brand into the gaming world. The next game would be the “official” sequel to Pac-Man from it’s original developer, Namco. Super Pac-Man: Hitting arcades in 1982, Super Pac-Man is considered the first proper sequel to the original Pac-Man as it was developed by Namco. Unlike Ms. Pac-Man before it, this was much more than just a slight re-hash of the original Pac-Man as it was built from the ground up on newer hardware. Super Pac-Man featured all new gameplay mechanics and ideas. Instead of the classic pellet eating from the previous two games, Pac-Man now collects keys to unlock and open up more of the maze. The mazes would contain various foods, fruits and even a cameo from the Galaxian (another Namco game) sprites. Once all the items had been cleared, you would move onto the next stage. The power pills from the previous games make a return, which allow Pac-Man to eat the ghosts. Now also included were “super power pills” which when Pac-Man eats them, he becomes “Super Pac-Man” which would turn Pac-Man big and allow him to move faster and even get through locked doors without a key. Super Pac-Man also included bonus stages that would appear at intervals. Pac-Man is put in a maze full of food items and must eat them all in order to collect the points on a countdown timer. Super Pac-Man was the least successful of the original Pac-Man series so far with many people commenting on the changes from the previous two games and the difficulty in controlling Super Pac-Man, resulting in Super Pac-Man only becoming a moderate success. With Super Pac-Man’s mediocrity behind, we move onto yet another one of those “unauthorised” Pac-Man games from Midway. Pac-Man Plus: Now the fourth title in the original Pac-Man series of games and released in 1982. Just as with Ms. Pac-Man previously, this follow up to the original was created without Namco’s permission. Despite Midway advertising the game as “the only legal PAC-MAN conversion package” and claiming it was “Exciting” and “New”. Unlike Super Pac-Man before, this was not exactly all that “new” at all. Pac-Man Plus was actually just a single modifier chip, which replaced the original game’s program code and graphics. Pac-Man Plus really did not differ too much from the original or Ms. Pac-Man. Almost the exact same gameplay mechanics are here, with Pac-Man having to eat all the pellets to clear the stage while avoiding ghosts. The maze is green instead of blue. Vulnerable ghosts are shortened and have a leaf sticking out of them. The fruits have been replaced by new items such as a can of Coca-Cola. The ghosts are now slightly cross-eyed. Eating a bonus item would cause the ghosts to turn both invisible and vulnerable at the same time, which doubles their point value. Eating a Power Pellet would sometimes has unpredictable results, such as turning the maze invisible or turning only three of the four ghosts blue. 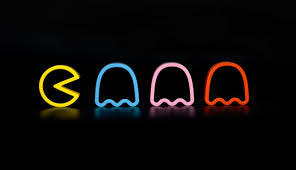 The ghosts were also faster and more aggressive than they were in the original Pac-Man. Pac-Man Plus was classic Pac-Man with a few tweaks and fans enjoyed it much more than the official sequel, Super Pac-Man. This about wraps up part I of this retrospective look at the original arcade Pac-Man series. See you in part II where we will see an evolution of Pac-Man and more unauthorised games from Midway. This entry was posted in LBoG: Retrospectives and tagged Arcade games, Billy Mitchell, Crazy Otto, Game retrospectives, LBoG: Retrospectives, Little bits of gaming, Midway, Ms. Pac-Man, Namco, Pac-Man, retro gaming, Retro gaming blog, Super Pac-Man on 22/05/2015 by Steve Perrin.